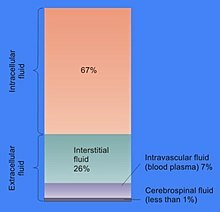 The cytosol, also known as intracellular fluid (ICF) or cytoplasmic matrix, or groundplasm, is the liquid found inside cells. It is separated into compartments by membranes. 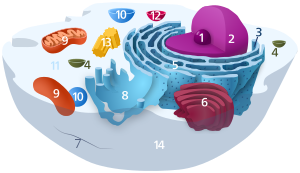 For example, the mitochondrial matrix separates the mitochondrion into many compartments. Prior to this, other terms, including hyaloplasm, were used for the cell fluid, not always synonymously, as its nature was not very clear (see protoplasm). ^ Cammack, Richard CammackRichard; Atwood, Teresa AtwoodTeresa; Campbell, Peter CampbellPeter; Parish, Howard ParishHoward; Smith, Anthony SmithAnthony; Vella, Frank VellaFrank; Stirling, John StirlingJohn (2006). "Cytoplasmic matrix". Oxford Dictionary of Biochemistry and Molecular Biology. Oxford University Press. doi:10.1093/acref/9780198529170.001.0001/acref-9780198529170-e-4665.